I think that Amy is a great lyricist. 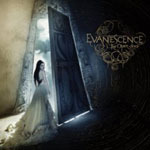 However, without Ben Moody, I really think that Evanescence has lost their ability to reach out and try new things. All of the songs on this album sound just like the songs on Fallen. I really loved Fallen, but it is important to move on and expand your horizons. But then, it's that same 'ol thing: if it worked the first time, why wouldn't it work the second or the third? OMG i love the song call me when you'r sober its soooo cool i love you guys at the moment im in love with james my ex and i just thourgh id just let yas all no lol...! I had never heard of Evanescence before last month. I was flipping through channels and caught this song just as the intro was starting. Amy Lee stopped me in my tracks, and just drew me in. First, her stunning beauty, then it was her amazing voice and the vocal harmonies at the end of the intro. When the guitars started rocking I was completely hooked. I especially liked the interaction of the classical piano with the heavy metal. But what the heck was the song about? Addiction or just some fickle guy? Well, it as turns out, it seems to be both and neither. I love how she kisses her finger and then puts it on the guy's mouth at the end of the video and then giggles. It shows her lighter side, having turned the tables on the guy and saying, "I've made up your mind." But let's look a little closer still. The song's not about him--it's about her. Amy's somehow allowed herself to get caught up in the insanity of his alcoholism. She's mad at herself and full of regrets for playing the fool (i.e., codependent) for so long: "Should have let you fall, lose it all [but I didn't]...we're only deceiving ourselves and I'm sick of the lie [that I've bought into and helped perpetuate]...how could I have burned Paradise?" If you've even been in her shoes, it all comes together in the song. Living with an addict or alcoholic is absolutely maddening--we think we're going insane--then, hopefully, one day we wake up and say "I'm sick of the lie." We've been enabling that person's behavior all along and now we have to choose whether to stay in the sick relationship pattern or say "enough! (I've made up your mind)"
I LUVVV THIS SONG SOOOOOOO MUCH!!!!!! Evanescence is my fav band whaever anyone says about them! Amy you rock. Hope to meet her someday!